Read the review by Independent Professional Reviewers (Bixler) of “The TurnKey Investor’s ‘Subject-To’ Mortgage Handbook”. Matthew Chan’s latest book for TurnKey Investors is for experienced investors who “wish to expand their financial repertoire by utilizing the ‘subject to’ mortgage.” (p.5) This review is based upon that guiding principle inasmuch as I, myself, am not one of those experienced investors, though my background was in directing lease management for a major educational institution. 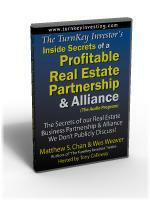 I therefore have a basic understanding of the logic behind and in real estate activities. I believe this is an important point to emphasize. Why? Because as I began to read, I found myself uncomfortable with the concept being presented. Specifically, “subject to” mortgage investing is a method of acquiring property by taking title and possession of real estate, but leaving the seller’s existing loan in place—a form of seller financing. It is to the author’s credit that he immediately identifies this as a problem for inexperienced readers. Having read several of Chan’s reference books and after sufficiently negating my earlier qualms, I settled back to be “trained.” Certainly Chan has the intelligence, experience and knowledge to write books in his professional field. However, I have found that Chan has also developed an excellent teaching skill by which he uses his writing for effective training purposes. 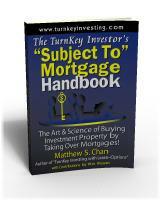 Investors or property managers should feel comfortable asking their own staff to learn and begin using the “subject” to mortgage transaction based upon using Chan’s handbook. Let’s see what he has to tell us! First, knowing that this is a little-known and little-used process, Chan advertises its availability¾”we buy houses fast.” This catches the eye of those needing to sell their hours fast! What that means is that a target audience is usually available. Why? Because there are always those individuals who have just changed jobs and therefore need to relocate quickly. Or there are those individuals who sadly face divorce or the loss of a loved one and find that they can no longer pay the high mortgage costs. 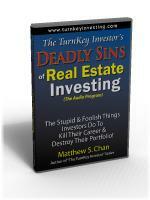 For whatever reason, needing to sell property quickly is oftentimes a traumatic experience. 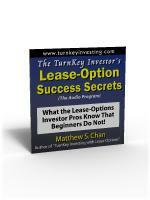 And, for many, waiting for financial institutions or real estate agencies just isn’t the answer. Having personally been in this situation, I must admit I looked favorably at this option once I realized how it worked. Because I had lost my job and knew I could not keep up my mortgage payments as a single professional woman, I immediately posted my home for sale. It was a nightmare as I first had to “fix” one thing after another and then wait for someone who might “happen” to come along and want to buy my home. It was just serendipity that I was able to acquire a small cabin in a nearby state and maneuver each activity to be able to both sell and buy another home as well as relocate within the time allotted; i.e., by when I would receive my last pay check! 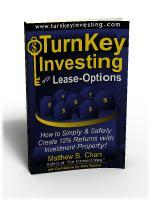 Matthew Chan could have offered me a much simpler option! And his book includes pictures of the wide variety of houses that they have acquired through the “subject to” mortgage process. In essence, Chan’s company would have taken over my former home as property managers, using the loan I already had in place. Now, individuals considering this option would need to understand quickly that they would continue to have an outstanding mortgage loan in their name. But somebody else would be paying that bill. And somebody else would have total control of the property. In essence, then, the seller in the position of having to quickly relocate has a little-known option if there are individual investors willing to handle their property. 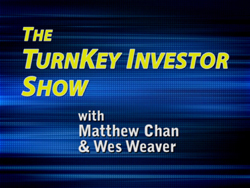 The Turnkey Investor’s program has the ability to do this…and then use your former property to enter into a lease-option activity with another individual. I’ve personalized this review to ensure that individuals who may hear of this process will understand its potential in their own lives. 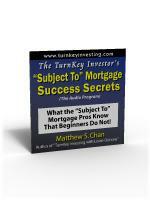 However, the book, for the professional, includes all the many details necessary to ensure that they are able to handle a “subject to” mortgage investment if or when the opportunity arises. 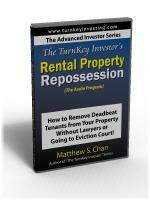 It takes a professional agency willing to help individual property owners. At the same time, the agency must have already invested sufficient research and experience in their field to make the process work within their agency. For those professionals wishing to consider “subject to” mortgage investing, this book is a must-read!